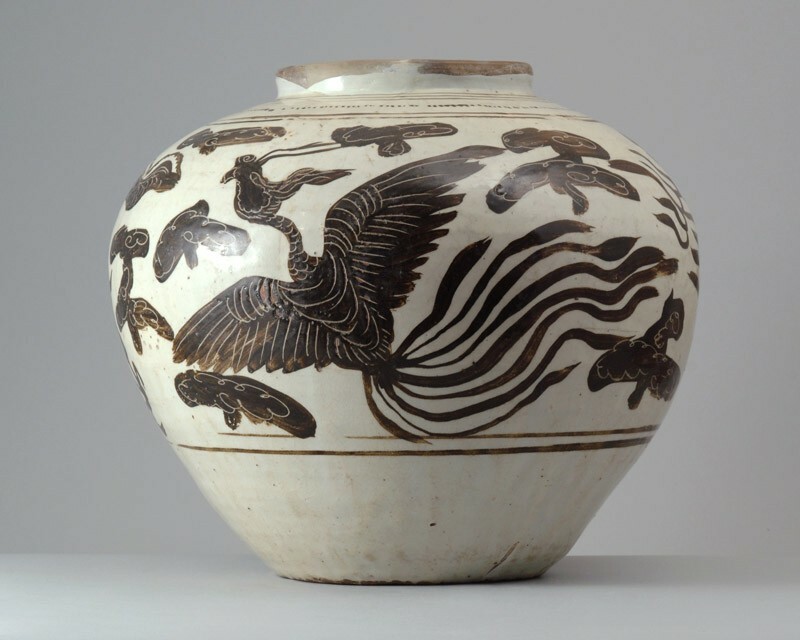 A similar jar was recovered from the wreck of a ship sunk off the Korean coast in 1323. The wide globular jar is very heavily potted, with a short straight neck and a shallow disc-shaped footring. The buff stoneware is covered with a white slip and painted with a large dragon chasing a flaming pearl, and a phoenix in flight, both surrounded by cloud motifs, all quickly painted in brown and with details incised to appear in white. The shoulder is decorated with concentric lines and a row of small dots. The slip and transparent glaze both end at the neck, the inside being glazed in dark brown. The footring and base are mainly exposed in the brown biscuit and show traces of brown glaze and white slip.